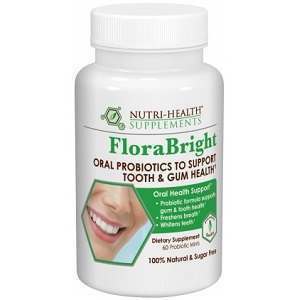 Nutri-Health FloraBright is a probiotic supplement designed to help freshen breath, whiten teeth, and improve overall oral health by creating healthy microflora in the mouth and body. It is a natural, chemical-free way to whiten teeth that uses natural ingredients which have been proven effective through clinical trials. This supplement contains a patented probiotic blend. The special proprietary blend of probiotics has been shown to naturally produce low-dose hydrogen peroxide which creates an inhospitable environment for harmful and odour-causing bacteria in the mouth, while also gently whitening teeth. It also contains 770mg of xylitol which is a natural sweetener that helps to balance pH in the mouth and prevent bacteria from sticking to the teeth, assisting with the prevention of cavities. Some research has also shown that xylitol can help to repair damaged or weakened enamel, and can slowly improve the quality and health of teeth over time. Other ingredients found in this supplement include natural binding and flavoring agents (cellulose, silica, sorbitol, natural vanilla and spearmint flavors, and vegetable stearate). The company recommends taking two mints daily, either at once or separately. For best results they suggest taking them after brushing your teeth, allowing the mint to dissolve completely in your mouth, touching all of the surfaces of teeth and gums. These mints can be used by both children and adults. There are no health recommendations, but the primary ingredients are considered safe for people of all ages and backgrounds. If you have a specific health concern relating to your teeth or gums, it is advisable to speak with your healthcare provider or dentist before taking these tablets. There are no side effects listed, and reading customer reviews across multiple sites revealed no adverse reactions. Of course, do not take this product if you are allergic to any of the ingredients. Through the company website, a 60-tablet bottle is available for $29.95 with a discount of up to 25% with repeat delivery. It seems to have been available through Amazon and other online pharmacies, but is not currently available through these avenues. FloraBright is backed by a one-year money back guarantee, but does not detail the terms of this. Generally, positive reviews combined with this guarantee indicate a company that stands by their product and the scientific research that went into its creation. Overall, this seems like an effective product to improve oral health, though it does not provide overnight teeth whitening as some reviewers would have liked. Using proven ingredients like xylitol and a proprietary blend of probiotics backed by scientific testing seems to provide overall positive results in terms of oral health and fresher breath with long-term use. Reviews are positive and indicate improved whiteness and quality of enamel, mostly with prolonged use. However, the guarantee is not very clear about the small details. A 60-tablet bottle will last roughly two months, which places this at a reasonable price range compared to similar products, but the limited places to purchase this product is a hindrance. Tim McClure	reviewed Nutri-Health FloraBright Oral Probiotics	on January 26th	 and gave it a rating of 4.